Hey everyone, Kayley here with some hair and outfit inspo for back to school. 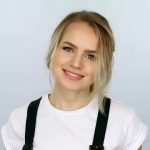 I put together three hairstyles that are super quick and super easy and added a little bit of outfit in with each one so you can see how I would pair it. That being said, let’s go ahead and get into the video. 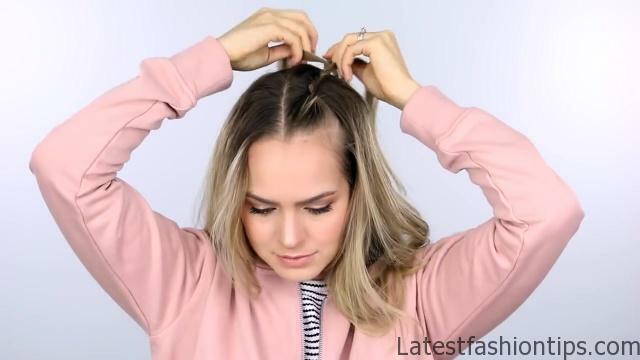 Start by creating a middle part across the top of your head. 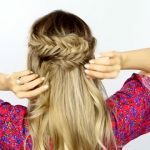 Then, on one side of your part, grab a large section of hair and begin braiding it backward toward where the bun is going to be. Once you reach the end you can go ahead and secure it with an elastic and do the exact same braid on the other side. Now take your two braids and some of the hair around them and put that up into a ponytail on top of your head. To finish it off, wrap the hair from the ponytail into a bun and pin it in place. And that’s it for this Sporty Spice hairstyle. You can wear this with anything, but to me it seems rather sporty so I paired these two easy braids with a bomber jacket, a cropped, striped shirt and some high waited jeans. Added in some black sneakers and this is the perfect sporty, comfy, chic look that you can rock all day long. Next we have this Casual Prepster hairstyle, this one is so quick and easy. Start by taking the hair that’s over your ear on both sides and leave that out over your shoulders. Then we are going to make a ponytail-slash-bun in the back with the rest of the hair. 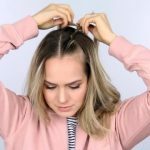 Just pull your hair into a low ponytail, and then on your last little pull-through, only pull the ponytail part of the way so that it creates a loop. Loosen up the hair that’s kind of around the base of the bun, and then we are ready to go on to the last step. Grab a section of hair from one side and sweep it back and over the ponytail elastic. Then just put it in place. Now do the same thing on the other side. Sweep it back over everything else and pin it in place. Loosen up some pieces right around your face if you want to, and then this is it for this hairstyle. For this hairstyle, I was thinking casual but stylish and I think this fits both of those goals really well. It is maybe a little bit of a risk but I like it. I put it with a little bit of a risky outfit too. I have this overall dress on, with a rolled up t-shirt and velvet boots. And I most like the velvet boots about this outfit, I just think they are super cute. 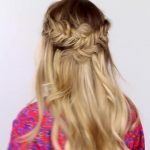 Now we are going to finish off with this Boho Princess hairstyle. 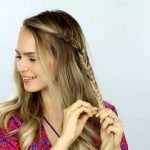 You’re just going to start by making a fishtail braid on one side of your part. I’m taking a large section of hair, splitting it into two and making that fishtail braid. Once you get to the end, just secure it with a bobby pin and then you are going to pull this apart. First I just kind of pull apart the braid as a whole so you get some slack in it. And then you can pull on individual little pieces of the braid as well. Now do the same thing on the other side. 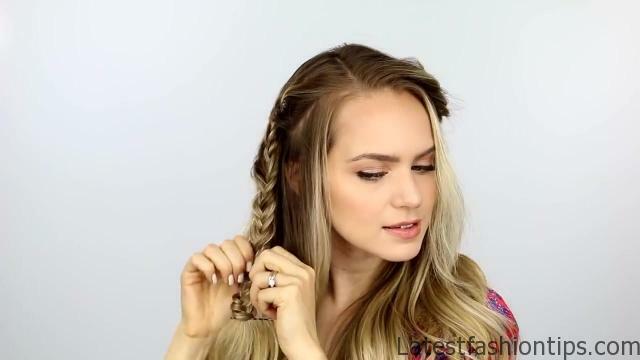 Remember, if you want to leave some hair out of these braids do that before you start the braid. And now all we have to do is pin it together. 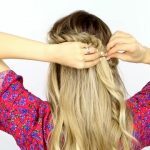 Start by taking one braid and sweeping it across the back of your head. 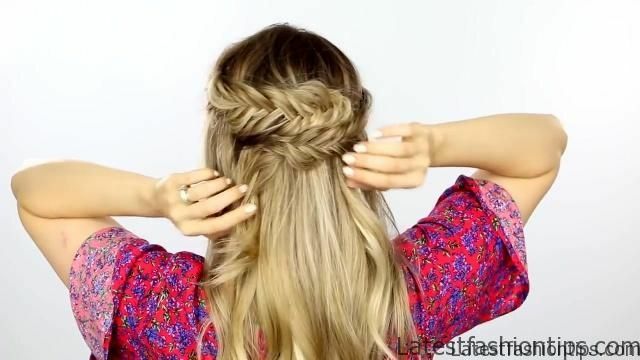 Once it is in place, go ahead and add a couple of bobby pins by pinning directly into the braid. Then, take that bobby pin at the end of your braid and reposition it so that it is pinning your hair to your head. And then we are ready to move on the next braid. Take that second braid across the back of your head and over the tail of the first one and then pin that in place like we did with the first one by pinning directly into the braid. And finally reposition that bobby pin at the end of the braid so that it is pinned against your head and you are all done. 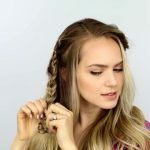 You guys know I love a good bohemian hairstyle and this is the perfect one to go back to school with because it is beautiful and will have everybody asking how you did it. Obviously I paired this with a pretty floral dress, and then I also added some thigh high boots to the mix because I love the pretty short dress with the thigh high boots, I just think it is the perfect combo for this hairstyle. And that’s it for these back to school hairstyles, I hope you liked them and I hope you try them out. I also hope you got some outfit inspo as well. 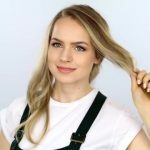 Be sure to subscribe for more hairstyles for everyday and I will see you in my next video. Mwa! Bye!